Ticks have become a health risk to millions of Americans. There are over 850 tick species, about 100 of which are capable of transmitting diseases. In the U.S. five genera, Amblyomma (e.g. lone star tick), Dermacentor (e.g. American dog, Rocky Mountain wood, pacific coast ticks), Ixodes (e.g. black-legged, Western black-legged ticks), Ornithodoros, and Rhipicephalus (e.g. brown dog tick) transmit to humans the vast majority of diseases caused by bacteria, viruses, protozoa, and toxins. Multiple diseases can be contracted from a single tick bite. You need to take precautions in preventing the spread of tick-borne diseases. The following are some suggestions. 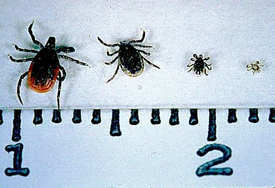 PICTURED RIGHT: From left to right: The deer tick (Ixodes scapularis) adult female, adult male, nymph, and larva on a centimeter scale. You can reduce the number of deer ticks near your home by the way you landscape and maintain your property. Studies show that tick numbers can be cut by 50% or more by making simple landscape changes to your property. Every home can benefit, although results do vary from year to year and property to property. Deer ticks live in the woods and are sustained by its higher humidity levels. They do not fly, jump or drop from above. Most Lyme cases are caused by the tiny nymphal deer tick which makes its home in leaf litter that accumulates on the forest floor, around stone walls and under groundcovers. Is your home surrounded by woods? Is your yard more woods than lawn? Does the tree canopy from the woods extend over your yard? Does your family use areas that are next to the woods? Do you have groundcovers near your home? Are bird feeders located close to your home or play areas? Do you have an unkempt stone wall? Is your firewood pile located next to your home? Are deer and other wildlife eating your flowers, trees or shrubs? If you answered yes to any of these questions, then you can and should make changes to your landscaped areas. Most ticks on lawns are found in the transition area between the lawn and the woods. Create a zone-defense here. Increase light and reduce dampness. Thin tree branches that overhang the lawn to let in more light. Clear out low brush, vines and leaf litter each year. Keep weeds cut. Keep a well-manicured border with the woods. Install a wood chip, mulch or gravel barrier where your lawn meets the woods. The dry barrier makes it more difficult for the ticks to migrate. Deer ticks feed on many small animals including mice and birds. These animals are responsible for infect the deer tick with the Lyme disease. Discourage wildlife from entering your safe zone by reducing their habitat and food sources. Seal cracks in foundation, screen areas under porches and decks. Place woodpiles far from the house. Locate bird feeders outside of your tick safe zone. Consider suspending bird feeding in the spring and summer when nymphal ticks are most active. Stone walls provide shelter for mice and small mammals that carry deer ticks. Clear away brush, leaf litter, fallen trees and rocks each year. Deer are a critical component of the deer tick's life cycle. Don't attract deer to your tick safe zone by planting flowers, shrubs or trees they like to eat.